After sunset, throughout the night on Earth's Moon, cold spots form in the regolith around some of the youngest, freshest impact craters. These cold-spot anomalies were documented on maps of nighttime regolith temperatures derived from thermal infrared data from the Diviner Lunar Radiometer Experiment on NASA's Lunar Reconnaissance Orbiter by Joshua Bandfield (Space Science Institute, Boulder, CO) and colleagues. They initially defined cold spots as surface patterns of colder nighttime temperatures, usually 2Kelvin to 10K colder than the surrounding terrain at the time of data collection, that extend to distances of about 50–100 crater radii beyond their young (less than one million years) source craters. Bandfield and coauthors describe the distal regions of the cold-spot patterns as having a fluffed-up appearance affecting the upper few to 10s of centimeters of regolith, but otherwise having similar visible characteristics and albedo to surrounding regolith. This oblique view of the Moon was produced with an LROC Wide Angle Camera mosaic on a Digital Elevation Model based on LRO Lunar Orbiting Laser Altimeter (LOLA) data. Diviner nighttime rock-free regolith temperature data were used to color this image to show warmer areas in white, red, and yellow and cooler areas in blues. 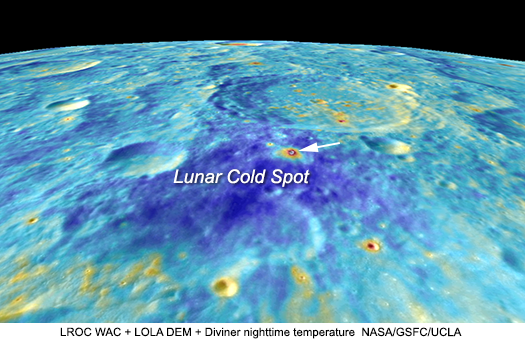 A cold-spot anomaly appears dark blue; its 1-kilometer-diameter source crater is indicated with a white arrow. The image is about 200 kilometers across. Since their detection in the nighttime regolith temperature maps, the lunar cold spots have been hot topics of research with more focus on (1) how the cratering processes altered the material properties of the regolith for storing and transferring heat to space and (2) the population of source craters themselves. 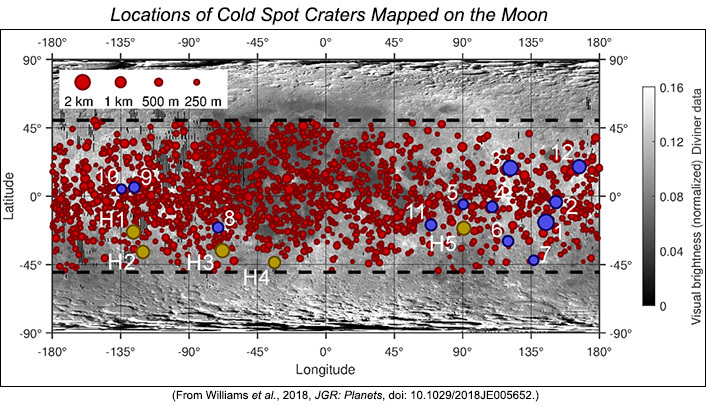 Jean-Pierre Williams (UCLA) and co-authors from the US and Canada have measured the diameters of fresh craters associated with cold spots to better understand crater size-frequency distributions and retention times of cold spots. Their mapping of cold spots takes into consideration more than the nighttime temperature data to include density and thermal inertia of the regolith. They reported 2,282 cold-spot craters ranging in diameters from 43 to 2315 meters, see map below. Map of the Moon, made from Diviner visible surface brightness data, showing locations of cold-spot craters with diameters ranging from 250 meters to 2 kilometers (see map legend). Blue and yellow points designate certain craters with diameters greater than 800 meters that are discussed in the research paper. Williams and colleagues estimate that cold spots fade over a few hundred thousand years with maximum retention times of one million years. What can these anomalously cold surfaces at young impact craters tell us about the Moon? In addition to the significance this work has on improving our understanding of the thermophysical properties of regolith and impact gardening rates, an interesting aspect that Williams and colleagues point out is that cold-spot craters may be excellent candidates for source craters of lunar meteorites. They found the modeled formation ages of the larger cold-spot craters coincide with the 0–1.4 million-year ejection ages (see cosmic ray exposure ages) of lunar meteorites.